The Teacher Walkout began on Monday, April 2, 2018. Q: Will graduation be moved for the Class of 2018? A: No. We have contracts in place with the Cox Center that cannot be changed. Q: Will the Prom be moved for the Class of 2018? A: No. The Prom is scheduled to proceed due to contractual agreements. Mid-Del Schools will be closed on Friday, April 13. School will resume Monday, April 16. Students will graduate on-time, and we will finish the academic school year on Friday, May 25th – prior to Memorial Day. Schools will communicate any changes to the daily schedule, testing, and activities with parents as soon as possible. Please check the district website, as well as individual school webpages for updates. Dr. Rick Cobb presented a Resolution in support of Mid-Del Teachers during the March 12, 2018, Board of Education Meeting. The Board of Education provided the unanimous 5-0 vote in support of its Mid-Del teachers to a round of cheers from the packed boardroom. On March 31, 2018, Dr. Rick Cobb released an extended statement regarding the teacher walkout. On April 6, 2018, Dr. Rick Cobb released a statement regarding the ongoing teacher walkout. On April 9, 2018, Dr. Rick Cobb published a Legislative Update to the Mid-Del Board of Education. 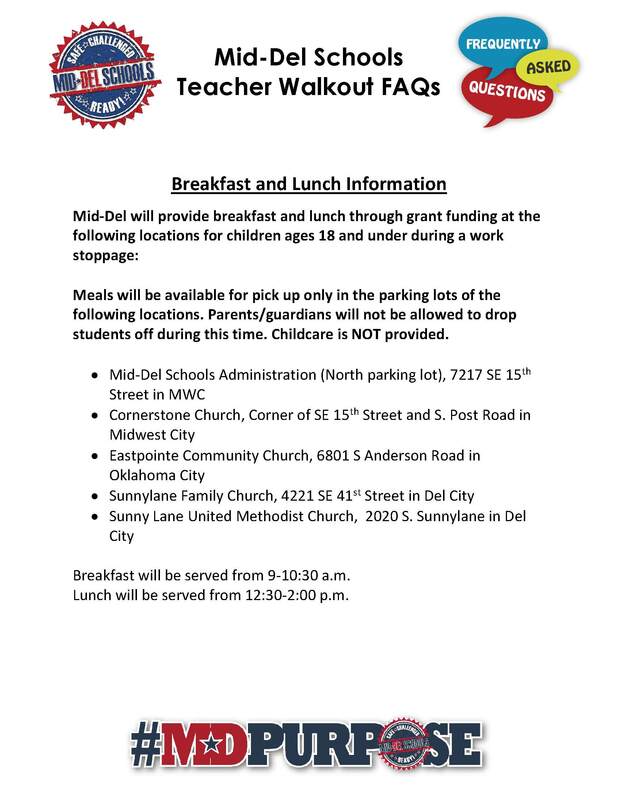 Mid-Del Schools will provide breakfast and lunch during the teacher walkout. Below are the times and feeding locations.